Do Aerobics Exercises Stave Off Dementia? Numerous studies have shown that seniors who do aerobic exercise on a regular basis can postpone the onset of Alzheimer’s, dementia and other cognitive disease. In fact, researchers assert it could slow down the progression of the disease. Below is everything dementia caregivers in Oshkosh, WI, need to know about aerobics and how it staves off dementia. 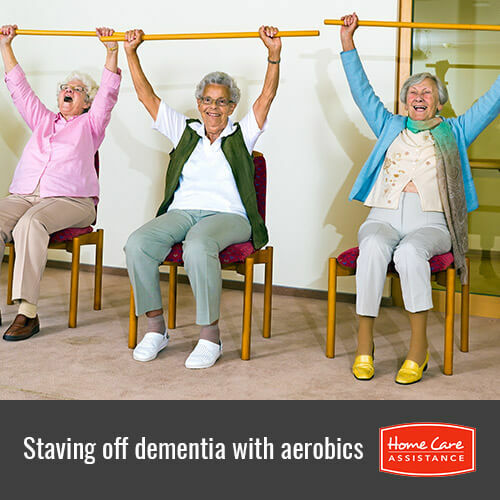 There are many aerobic exercises that seniors can do at home. Some examples that a senior loved one can do at home include walking, dancing, bicycling, yoga or any other exercise that raises the heart rate. Oshkosh elderly care professionals assert that even vigorous cleaning can be used as a form of aerobic activity. The senior should aim for 30 minutes a day at least four times a week. There is a strong correlation between heart health and cardiovascular disease. The healthier your loved one’s heart, the less chance he or she has of developing Alzheimer’s disease or dementia. Doing aerobics exercise has been shown to lower the risk of high cholesterol, hypertension, cerebrovascular diseases and diabetes. All of these diseases increase the likelihood of developing Alzheimer’s by 200 percent. Seniors who exercise show a marked improvement in their ability to pay attention, plan and organize. Doctors feel that the increased blood flow to the brain stops or slows down the development of amyloid plaques in the brain. Research also suggests that seniors who perform aerobic exercises on a regular basis are better able to multitask. Scientists are also starting to understand that seniors with dementia feel better emotionally when they exercise regularly. The largest positive change is seen in people who have also been diagnosed with severe clinical depression. Seniors with dementia report fewer occurrences of schizophrenia and mood disorders when they raise their heart rate through exercise regularly. Exercise is the cornerstone of senior health, and that’s not just for seniors with cognitive disorders. Help your loved one stave off dementia and maintain a balanced lifestyle with Home Care Assistance. In addition to helping seniors maintain healthy lifestyles, we provide flexible live-in, hourly and respite care Oshkosh families can trust to be there for seniors anytime of day or night. Call (920) 710-2273 today to learn more about our unique services and how we can customize them to help your loved one.